Standing atop an elegant moulding and doors with raised panels, our Evendale Court Canted China Hutch is an heirloom worthy, Amish-made hardwood treasure. 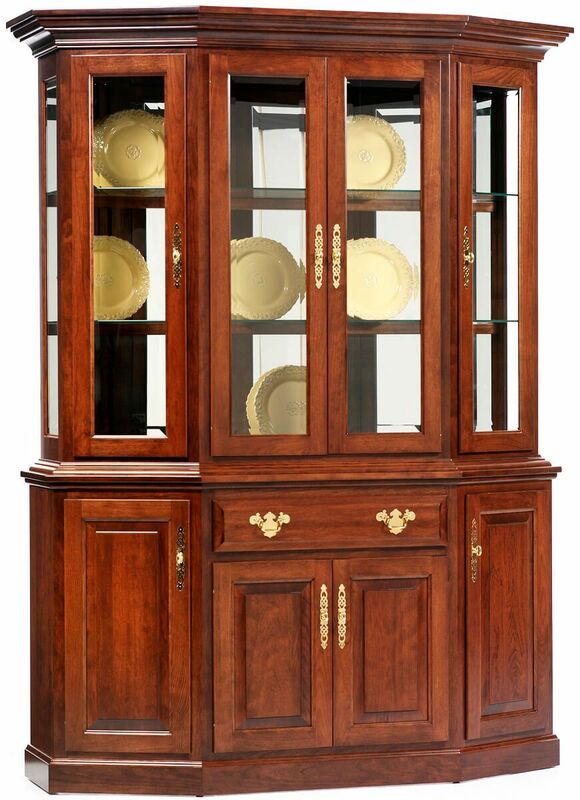 Your family will enjoy your Amish handmade Evendale Court Canted China Hutch for generations. Traditionally styled with a mirrored back and glass sides display, your Queen Anne cabinet measures an impressive 61"W x 81"H with a canted silhouette. While the upper display is illuminated with a recessed touch lighting system, the large buffet offers plenty of storage behind raised panel doors a single full extension drawer. Built to order, your china cabinet will be one of a kind when you select from our options menus the features you prefer. If you prefer the Evendale Court Canted China Hutch as pictured, select a Christmas Cloves wood finish over Cherry.